For Malaysian artist Benedict Chong, Mount Kinabalu is one place which he will not get tired of painting. The highest peak in Southeast Asia in Kota Kinabalu is one of the most painted landscapes not only in Sabah but also around the country. Chong is based in Kota Kinabalu where he has a lot of stories about the mountain. The 62 year old artist was born in Menggatal and used to work for Telekom which required him to go to the Kinabalu Park station every month. It was then that he cultivated his love for nature around him as he would have to walk up to the station in his stays which would stretch on for weeks. Such an opportunity was a blessing where he was able to observe the mountain and study its lines and contours. He added that it was probably why he painted the mountain so much. After all, the mountain looks different from different places and Chong got quite a lot of differing perspective. To date, the talented artist claimed that he has painted ‘hundreds’ of paintings of Mount Kinabalu where he was also one of the participants in the Sabah Art Gallery’s Invitational Artists Exhibition where he is showcasing his Lepa-lepa body of work recently. 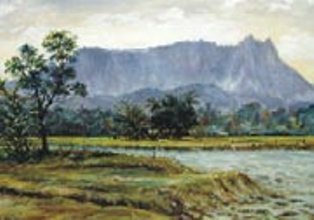 His Mount Kinabalu paintings have been widely demanded by art lovers where they have already been bought by collectors in China, Japan, Taiwan, Brunei and Australia. Chong has been involved in the arts for many years where he has been participating in exhibitions since 1970 and travelled to the likes of Hong Kong, Seria and in his home country.